The grouping looks at preventing the base erosion and profit shifting through mutual cooperation by practices that involve abuse of tax treaty benefits and incomplete disclosure of information and fraudulent claims. BRICS nations are rapidly finding newer areas of synergy. Earlier this month their National Security Advisors (NSAs) had held a first stand-alone meeting and their health ministers had also met. Both meetings took place in New Delhi. BRICS has just made a new beginning – also in New Delhi – when their heads of the revenue met for the first time to deliberate on issues of mutual concerns related to tax administration, international taxation, transfer pricing, cross- border tax evasion and tax dispute resolution mechanisms. The two-day meeting (January 17-18) produced concrete deliverables as the five-nation transcontinental grouping affirmed their continued commitment to promote closer coordination and cooperation in the area of tax administration and identified seven areas of tax policy and tax administration to achieve this combined objective. The respective country delegations were led by Carlos Alberto Freitas Barreto, Secretary, Federal Revenue of Brazil, Aleksey Overchuk, Deputy Commissioner, Federal Tax Service of Russia, Sumit Bose, the Revenue Secretary of India, Xiao Jie, Commissioner of State Administration of Taxation, China and Oupa Magashula, Commissioner, South Africa. Russia has a deep and abiding interest in the area of transfer pricing and has been in the forefront in various international fora on this front. BRICS is yet another forum where Moscow has been pro-active in this context. In July 2011 the Russian President signed a federal law that introduces new transfer pricing controls in the country. The new rules, based on Organization for Economic Cooperation Development (OECD) Guidelines, became effective on January 1, 2012, taking both taxpayers and tax administration to an absolutely new legal environment. Overchuk has outlined the Russian template in this regard very candidly. At an important conference of OECD held in Paris in September 2012, Overchuk had said that Russia’s new legislation was meant to address domestic transfer pricing issue and avoid the creation of profit centres in regions where the profit was not actually created as these result in unfair distribution of revenue among different regions. “There is a widely accepted view within the community of Russian tax professionals that the new transfer pricing legislation is the most significant change in the tax system of the country since the introduction of the Tax Code in the late 90th,” Overchuk had remarked. It must be pointed out in this context that the Russian view is that in an economy like Russia’s, relying on the export of mineral resources for revenue, the absence of effective tax administration of transfer pricing has presented a visible problem. Further integration of Russia into the world economy, the increase of international trade and a favourable outlook for WTO accession have been important factors that contributed to Russian interest in addressing this issue. The BRICS’ revenue heads’ roadmap for the near future was outlined in their Joint Communiqué which identified broad contours of their mutual cooperation in this field. The document emphasises the grouping’s resolve to enhance their synergies in development of international standards on International Taxation and Transfer Pricing taking into account the aspirations of developing countries in general and BRICS countries in particular. The communiqué recognises the importance of the economic and commercial links amongst BRICS countries and the need to contribute to the strengthening of these links. Other areas of mutual cooperation include strengthening the enforcement processes, sharing of best practices and capacity building, sharing of anti-avoidance and non-compliance practices and promotion of effective exchange of information. The basic objective of BRICS’ cooperation in this particular sector is aimed at preventing the base erosion and profit shifting through mutual cooperation by practices that involve abuse of tax treaty benefits and incomplete disclosure of information and fraudulent claims. The New Delhi communiqué of the BRICS’ revenue heads underlines their intent to together cobble up capacity building, improvement of systems and sharing of resources to the area of tax administration in a way that will benefit the people of BRICS countries. In effect this meeting carried forward the decision taken during a meeting of the BRICS Finance Ministers and Central Bank Governors held in Washington DC on April 19, wherein they decided to develop a cooperative approach on issues relating to international taxation, transfer pricing, exchange of information and tax evasion and avoidance. Contribute to development of International Standards on International Taxation and Transfer Pricing taking into account the aspirations of developing countries in general and BRICS countries in particular. Strengthen the enforcement processes by taking appropriate actions for non-compliance and putting more resources on international cooperation. Sharing of best practices and capacity building. Sharing of anti-tax evasion and non-compliance practices, including abuse of treaty benefits and shifting of profits by way of complex multi-layered structures. Development of a BRICS mechanism to facilitate countering abusive tax avoidance transactions, arrangements, shelters and schemes. The BRICS revenue heads expressed their concern at the erosion of the tax base by practices that involve abuse of tax treaty benefits, incomplete disclosure of information and fraudulent claims, and jointly agreed to work together to address these concerns. They pledged to jointly prevent the base erosion and profit shifting and also produce a paper on these subjects for mutual benefit of BRICS countries. The intense activities of BRICS in diverse fields like security and health earlier this month, and now in the revenue sector, is indicative of how quickly the grouping is putting its act together in virtually every important area under the sun. 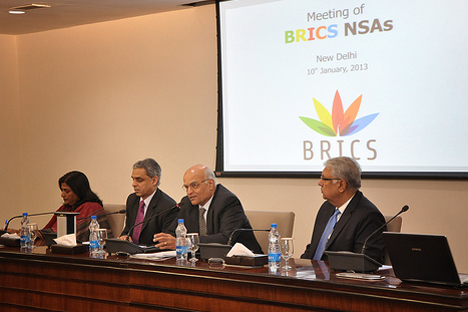 The recent New Delhi meetings project a new-found synergy among BRICS. If it continues going at this rate, BRICS is all set to become a major international force to reckon with.